Interim Gada Prize - Enter Now! Now is the time to submit entries for the $20,000 Interim Gada Personal Manufacturing Prize. Follow the link. The deadline is the end of November. TL;DR : open source is a philosophy, not a checkbox. Find more collaborators, not customers. The future is open. 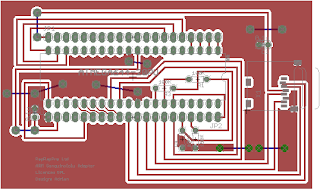 I thought that it would be useful to take a standard and widespread bit of RepRap electronics - the Sanguinololu - and give people a way of easily upgrading it to use a much more powerful processor. This is the result. 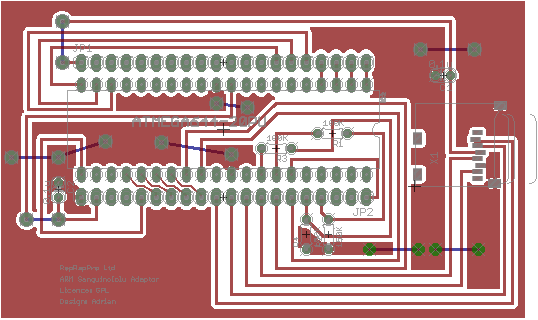 It is a PCB that you plug an MBED NXP LPC1768 ARM development board into. It then plugs into the socket previously occupied by the ATMEGA chip on the Sanguinololu. It also has an SD card socket built in. It has been deliberately designed single-sided with fat tracks and big gaps to make manufacture easy by DIY etching or milling techniques. All the details and files are in RepRapPro Ltd's Github repository here.